Sara here, catching up after a long long loooong end of 2012. I love the hustle and bustle of the holidays and finishing up the year, but being that busy always takes its toll. Brad and I had a wonderful Christmas, but spent most of our vacation time being quite sick. But we're finally getting back to normal and are back in the office working, planning and getting 2013 in gear! But before we do that, here's a bit of a December wrap up! 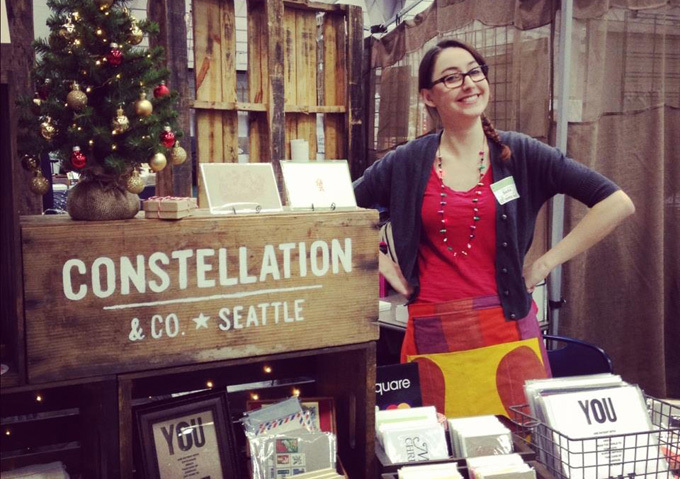 We participated in our first winter Crafty Wonderland show in Portland. It was a great turnout, and an amazing show to shop! We did a good chunk of our holiday purchases at the show, as well as at Portland Bazaar (we left Cherish in the booth and ran off to visit! ), and Wanderlust (my new favorite store in Portland). We launched the Cosmic Sans project website, and it went viral! We've found it all over the place. Here are some of the most exciting places we've seen it shared: Quipsologies, The Smithsonian Blog, The Maddow Blog, Design Taxi, and i09. Remember our desk project? She had a starring role in our Christmas decorations this year, keeping our stockings hung with care. Brad & I were able to get away for a few days after Christmas to get some rest before the new year. We stayed at Lakedale Resort on San Juan Island for the first time, and fell in love. We will definitely be back! While taking a break from work, Brad had some fun putting together a photo blog for our little family! We got a new camera awhile back, and are documenting our adventures again. I'll share some highlights here, but definitely check out the photo blog for updates about what we're up to personally. So now you're caught up on the goings-on. We've got a very exciting year planned, but it's all on the "down low" for now. Check back in often, you don't want to miss it!